It is becoming increasingly common that iPhone and iPad owners who use the App Store on a regular basis may have more than one Apple iTunes account through which they purchase and download apps. This could be for a number of reasons including holding separate accounts after emigrating to a new country, holding different IDs for the purchase of different accounts or merely just because it’s a free world and people can do whatever they wish. In circumstances when a single device is used by a family household, and each member of that family has their own account in order to buy content and apps, it can become a bit of a logistical nightmare to update all of those apps if they have been purchased across multiple accounts. The process would involve receiving the annoying onscreen error message advising that the app wasn’t purchased on the registered account, followed by logging out of the account through settings, entering the new account details and then repeating the whole process until all updates are downloaded. Not exactly a seamless process. 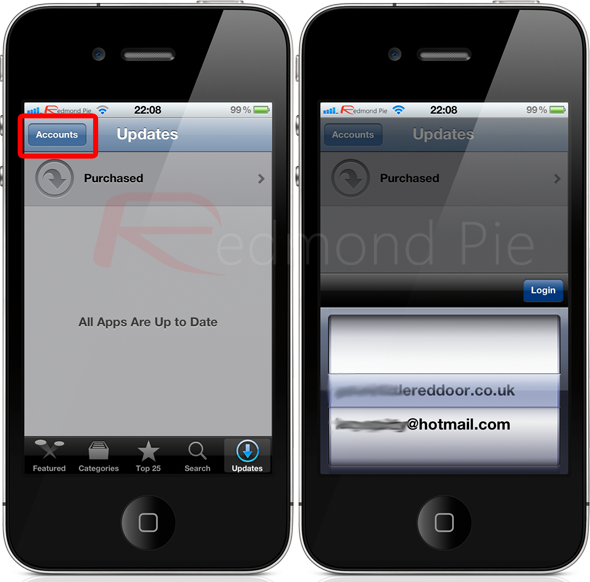 Step forward a package in Cydia known as AccountChanger, which is aptly named considering its only function in life is to allow the seamless switching between Apple IDs through the Updates section of the official App Store. After installation, the App Store Updates tab is altered to include an ‘Accounts’ button in the top left hand corner of the tool bar. The Accounts option functions exactly as you would expect and when pressed; brings up a picker view, displaying all of the Apple IDs which have previously been used with that device. The purpose of this is to be able to easily select a secondary ID and then update as necessary without the need to remove and enter a new account through the ‘Store’ panel in the Settings app. The picker view will present all Apple IDs that have previously been associated with that device, meaning that there are no options to configure and no place to manually add IDs. If you have more than one account that you would like AccountChanger to recognize but doesn’t then you will need to manually remove the existing account and enter the new one through the usual methods as a one time exercise in order to get AccountChanger to recognize it. For those who are jailbroken and have multiple Apple IDs, AccountChanger could prove to be a life saver, certainly shaving off a lot of time from your update process. I would love the see the PasswordPilot tweak updated to be able to store more than one account password so the two could work side by side for ultimate App Store automation and time saving. AccountChanger is available as a free of charge download on the BigBoss repository and requires iOS 5 or above.